One thing that most of the fairy tales had in common was the obsession of beauty of the women characters. Be it Cinderella’s wicked step sisters or Snow white’s evil stepmother, their story happened in the first place because of their mesmerizing beauty. So it can be easily concluded that it’s not our fault that women are crazy about beauty products as they have it in their GENES! According to historians, one of the first beauty products was during The Ancient Egypt time where they used sandalwood, perfume and aromatherapy products for pilgrims like an antiseptic. In the early 19th century, only the actors were allowed to wear makeup. But only after World War II that people were allowed to use beauty products in the west. Cosmetic Industry or Beauty care industry are companies that manufacture or make personal products such as cream, lotions, perfumes or makeup, skin care, fragrances, hair care etc. A market research report states some staggering facts. On an average, women above 18 years spend $144 a year on beauty products . 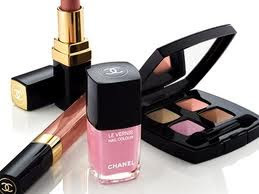 The beauty products industry is estimated to grow annually by 8.5% till the year 2014. This shouldn’t be surprising as an average woman spends at least 20 minutes to get ready. Women, irrespective of what age always has a soft corner for beauty products. This was proven during economic slowdown, only 45% woman cut back on their beauty spending. “The lipstick effect” is the best example of beauty products during an economic slowdown, Women didn’t cut down on their purchases instead they indulged in cheaper products .This industry has seen a consistent growth since a long time. It’s a known fact that women are crazy about beauty products but that isn’t the only factor, there are several factors that accelerate the demand in the market. • Easy availability of International brands in the store is increasing the demand for luxury perfumes and brands. • Globally, rising per capita incomes and higher spending powers. • Men also becoming more conscious of their looks and hence they too adding to the demand. • An aggressive promotional strategies used to market the products. • High Profile celebrities promoting the brands which results in their fans purchasing the products. • Tech Savvy consumers using online shopping methods to purchase exclusive products. • Majority of famous brands has smaller versions of their products that don’t allow people to return empty handed. • Free sample and discounts offered by brands to lure customers. • Advancement of technology that helps them to bring new and better products in the market. Women have always been very coy about their spending on beauty products. Some of the best brands in the market right now are MAC, Proctor Gamble, L’Oreal, Dove, Channel, and Lancôme Etc. The beauty product market has evolved with time. This constant change has not only bought better and new products in the market but also increases their foothold in the market. If you are looking for best beauty products.I think this place is wonderful to get accessories at affordable rate.